The Ottawa Senators will have plenty of time to ponder their latest loss. 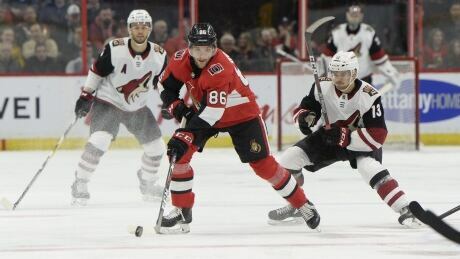 Vinnie Hinostroza scored twice and added an assist as the Arizona Coyotes defeated Ottawa 3-2 on Tuesday night in what was their final game before their nine-day break around the NHL all-star game. A win would have allowed the Senators to go into the upcoming break feeling good about things, but instead will be left wondering if it was part of the problem. "I think it's natural to look for something when you lose, but I don't think that was the issue," said Bobby Ryan, who scored his 11th of the season. "I think everyone came to play and the work ethic was there so you can't take that away from the guys, but I guess somebody will put a finger on it somehow." Derek Stepan also scored for the Coyotes (23-22-4), while Darcy Kuemper stopped 25 shots. Phoenix continues to play well and is now 6-1-1 in its past eight games. "They came out flying in the first 10 minutes and (Kuemper) kept us in the game," said Hinostroza. "We stuck to what's worked for us and it led to some goals and some good defence. We've been playing really good hockey right now and we like where this is going and we just want to keep it going." Ryan Dzingel scored the second goal for the Senators (19-26-5), as Craig Anderson, making just his second start after missing 12 games with a concussion, made 30 saves. No one will want to forget this game more than Ottawa rookie Brady Tkachuk. He struggled throughout the night and had a turnover that resulted in a Coyotes goal. "No one's going to take it harder than him, I'm sure," Ryan said. "As teammates we need to say we need you down the stretch, we need you to be the player that you're going to be. You're going to have growing pains. Everyone is going to turn pucks over, it's just the way it goes. "For him he's so competitive and so hard on himself that you want to lighten that load on him a little bit as older guys and just tell him we're not blaming that game on you by any means or that goal. It's all part of the game, but Brady's going to be a hell of a player and we're going to stick by him." The Coyotes led 3-1 to start the third, but Ottawa made it a one-goal game as Dzingel scored his 20th at the seven-minute mark. Ottawa pushed for the equalizer and Mark Stone had a great opportunity, but was unable to get a decent shot off. Trailing 1-0, the Senators tied the game in the opening minutes of the second period. Dzingel made a great pass to Ryan, who made no mistake to beat Kuemper high glove side. Arizona wasted no time regaining the lead scoring twice in a span of three minutes. "We had a tough second period," said Anderson. "It was one of those things where we played pretty good in the first and the second period it was back and forth and they had momentum for a little bit and got momentum and got a couple goals." Hinostroza scored his second as he took a bounce off the end boards and squeezed it behind Anderson. Coyotes coach Rick Tocchet gave much of the credit to the trio of Hinostroza, Stepan and Richard Panik. "The Stepan line was excellent," said Tocchet. "They had a lot of possession time, they changed momentum when they were on the ice so they did a great job for us." Stepan made it 3-1 as he completed a nice give-and-go with Richard Panik. The Coyotes opened the scoring midway through the period as they took advantage of a Tkachuk turnover. Panik intercepted Tkachuk's pass and sent the puck to Hinostroza, who was all alone at the side of the net. Earlier in the period Tkachuk fell at the blue-line, allowing Josh Archibald to break in alone on Anderson. The win did prove costly for the Coyotes as captain Oliver Ekman-Larsson left the game with a lower-body injury and will be re-evaluated Wednesday. Niklas Hjalmarsson left early in the third after taking a puck to the face, but did return. This was the Senators final game until Feb. 1 when they will take on the Pittsburgh Penguins, while the Coyotes are back in action Wednesday in Montreal against the Canadiens.